Just before Christmas we had a great time being involved with the TESMAS bus. TES ran a competition to give something back to their most inspiring teachers in the UK. The winning school received the TESMAS bus with a live performance from Tom Cary, a Michael Buble tribute act. An immense effort from our team to get this vehicle turned around in time for the event. 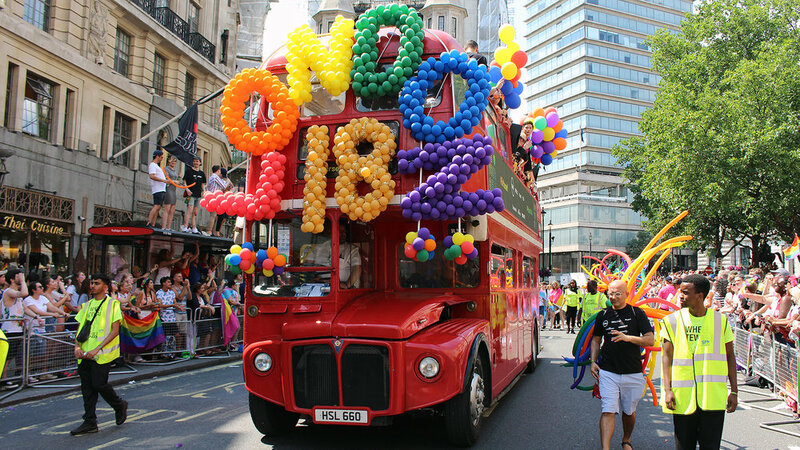 We recently procured this vehicle from another operator, she had been both mechanically and cosmetically neglected and our team and suppliers pulled out all the stops to re-commision her in time for Pride in London 2018 and our valued clients at Dell UK. Remember even gearboxes need oil and a Routemaster is not just for Christmas! We will continue to improve this vehicle to our high standards of maintenance and presentation in the coming months. A great start to 2018 with a high profile promotional bus for Sennheiser. RMC1496 proving again to be a versatile platform. 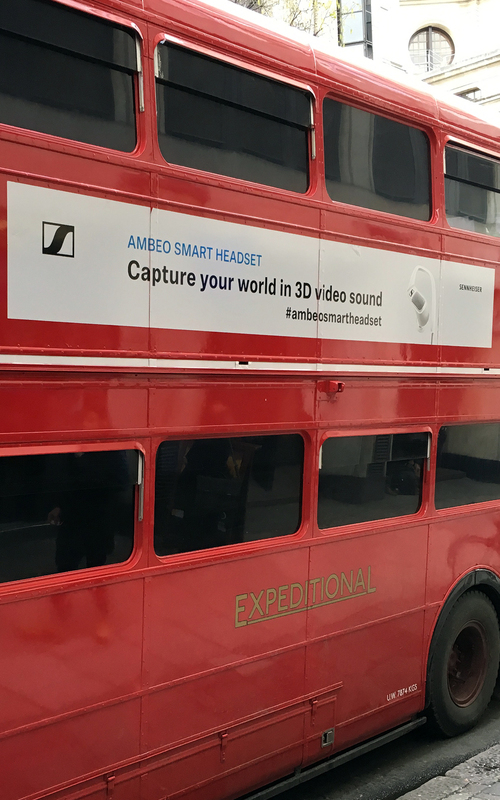 The bus acted as a static meet and greet for press, journalists and social media influencers for the Sennheiser's Ambeo 3D sound headset, a new device aimed at Vloggers and video journalists. After the initial briefing the bus took our passengers to Piccadilly Circus so the headset could be tested in a busy environment and then onto a quiet garden to test in a quiet environment. Sky Sports & the Professional Darts Corporation hire our Hospitality Bus as a Social Media Studio & Fan Space for the World Darts Championship at Alexandra Palace. Sporting a striking Vinyl Wrap design whilst the interior once again proves to be a versatile space. See RML2697 do what she does best for the Lord Mayors Show 2017. It was an honour to be able to take part in the historic parade which is the oldest and grandest civic procession in the world especially as the date this year fell on the 11th November with the procession commencing at 11.02am after the 2 minutes silence. RMC1496 is seen here performing her first duty as an Exhibition Bus for Warner Music at the Brand Licensing Europe event at London Olympia. Along with our recent interior refurbishment the bus was also re-painted in white and blue and vinyl wrapped to produce this stunning finish for the three day event. RML2697 hosted the race starters and VIP team whilst also acting as a stage back drop at the Hackney Half Marathon 2017. RM1871 (Elizabeth) fresh from the body shop. RM1871 (Elizabeth) fresh from the body shop. Seen here glistening in the Spring sunshine in the Queen Elizabeth Olympic Park, Stratford. SRM7 is undergoing a reversion back to her original colours and fleet number RM1871. Seen here in the paint booth having undergone removal of the previous paint layers and any bodywork repairs required. A primer coat has been applied, ready for the finish to begin in original LT red. We are proud to announce the addition of SRM7 to our fleet. Formally fleet number RM1871, she was painting in silver by London Transport in 1977 to commemorate Queen Elizabeth II’s silver jubilee. Her new life begins with Expeditional. Watch this space for updates on her future. 2697 is undergoing a major refurb in preparation for the new year.